No-one can deny the Interactive Flat Screen is a work of art. Simple, beautiful and powerful, it is so much easier on the eye and mind than the white board and projector. It is a clean, self-contained, minimalist piece. All its predecessors fall far short of it. The aesthetics of the interactive touch screen go beyond how it looks. Using it is also aesthetically pleasing. Once you get into the rhythm of it, it becomes a kind of dance. A dance between your finger and the interface. Using the interactive flat screen is like listening to Mozart, it is such an elegant experience. It is also a powerful experience – having so much information and content at your fingertips and being able to manipulate it with such ease. Invest in an interactive flat screen and you will become a content master in no time. The touch panel is almost literally a blank canvas. Every morning it is there, hanging on the wall, ready and waiting to be painted on. You will master it swiftly and so will your pupils. Indeed, the interactive flat screen is designed to make you a Rembrandt in a very short time. 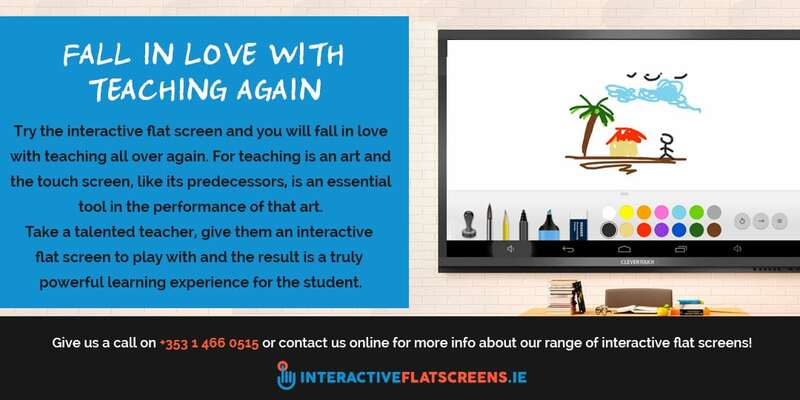 Try the interactive flat screen and you will fall in love with teaching all over again. For teaching is an art and the touch screen, like its predecessors, is an essential tool in the performance of that art. Take a talented teacher, give them an interactive flat screen to play with and the result is a truly powerful learning experience for the student. 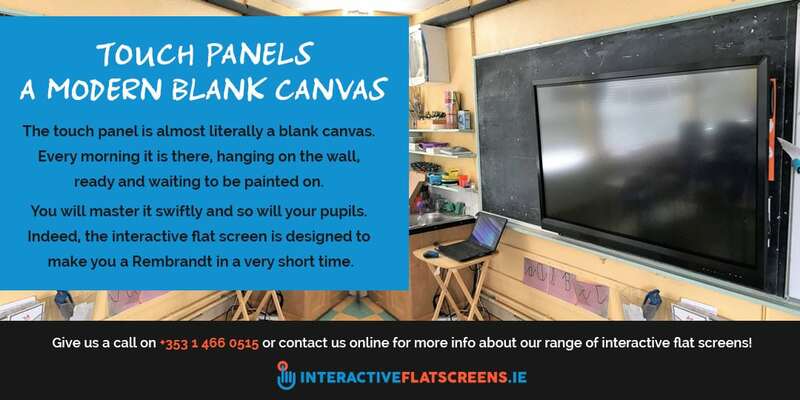 There is no end to the ways the interactive touch panel can be used in the classroom. It is limited only by the bounds of your imagination and creativity. Part of the joy of using the interactive flat screen is sharing it with your pupils. This is yet another reason why the interactive flat screen is superior to the whiteboard and projector. It accommodates a more engaging and active role for the student in the learning process. Like all artistic media, the interactive flat screen is both liberating and empowering. It facilitates self-expression. In the right hands it will work wonders in the learning environment. 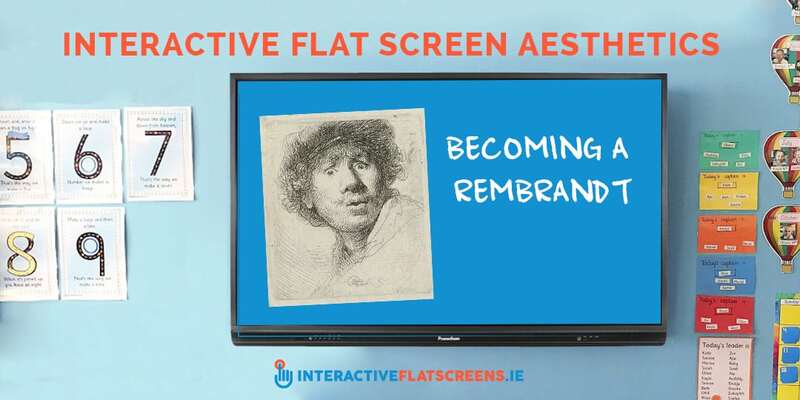 So, contact us today and learn more about how you can become a Rembrandt in the classroom through using the interactive flat screen. We are so confident in these machines that we guarantee your classroom will be made into a place of playful and joyful teaching and learning, bounded only by you and your pupils’ imaginations. Give us a call now on +353 1 466 0515 or contact us online for more info!